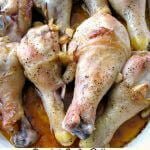 An easy to make dinner main dish ready in 45 minutes, Roasted Garlic Butter Chicken Legs are juicy bone-in chicken legs with butter and lots of garlic. I’m back!! School started yesterday, and even though we only had a short summer vacation because Amanda went to a summer program this year, I’m ready to get back to doing what I love, sharing my favorite recipes with you! We had a cookout last Saturday to close out the summer, but I didn’t make anything new. 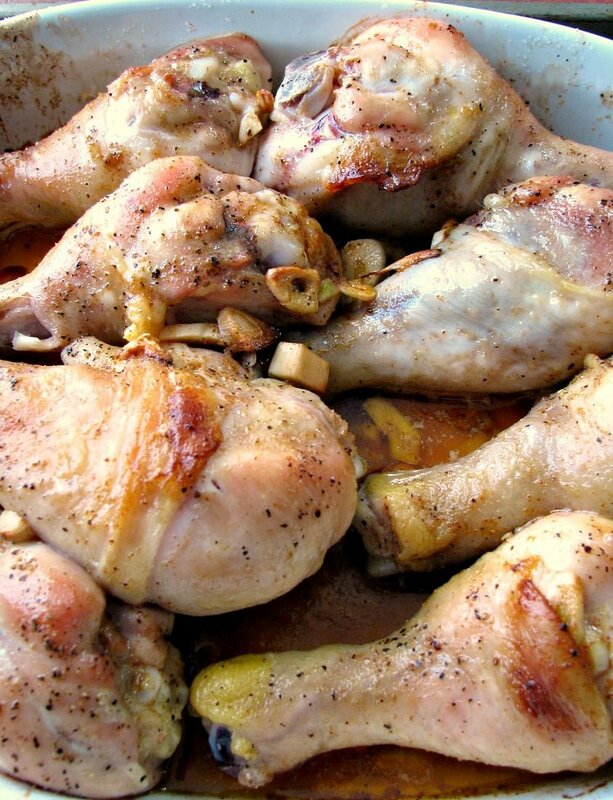 These Roasted Garlic Butter Chicken Legs were made two days later as a last minute idea to use up the chicken legs my husband didn’t grill. I’ve been babysitting my “nieces” kids again. They are now 3 and 1 1/2, along with my own 8 year old, and finding something they will all want to eat can be challenging. Speaking of that, Rants From My Crazy Kitchen was the featured blog of the week this week on “PA Live”, a local news show. Check out the segment! They mentioned that my daughter doesn’t like to try a lot of my recipes because she’s so picky. Amanda heard that and went ballistic! Screaming, crying, I embarrassed her on TV, and on and on. Maybe she will read this someday. I’m sorry, honey, they didn’t lie. I made the Roasted Garlic Butter Chicken Legs on a night when I was babysitting. Two out of three ate it, the baby thought it would be nice to feed to the dogs. It’s really simple to make. Just peel and slice (not mince, slice) 10 garlic cloves and mix the sliced garlic in with a stick of softened butter seasoned with paprika. Spread the mixture all over the chicken legs, rubbing it in and pushing some under the skin. Season the chicken with salt and pepper and bake for about 45 minutes, basting after 20 minutes, then once or twice again, until the chicken reaches at least 165 degrees and the skin is golden. Another kid friendly chicken recipe my family loves is Ranch Chicken Thighs. I’ll have to make them again when I babysit and see if they like it. Besides that I have at least 41 Chicken Recipes I can try. Some of them have horrible photos I need to update anyway. Combine the soften butter, sliced garlic, and paprika well. Rub the mixture all over the chicken legs, stuffing some under the skin. Season all over with the salt and pepper. 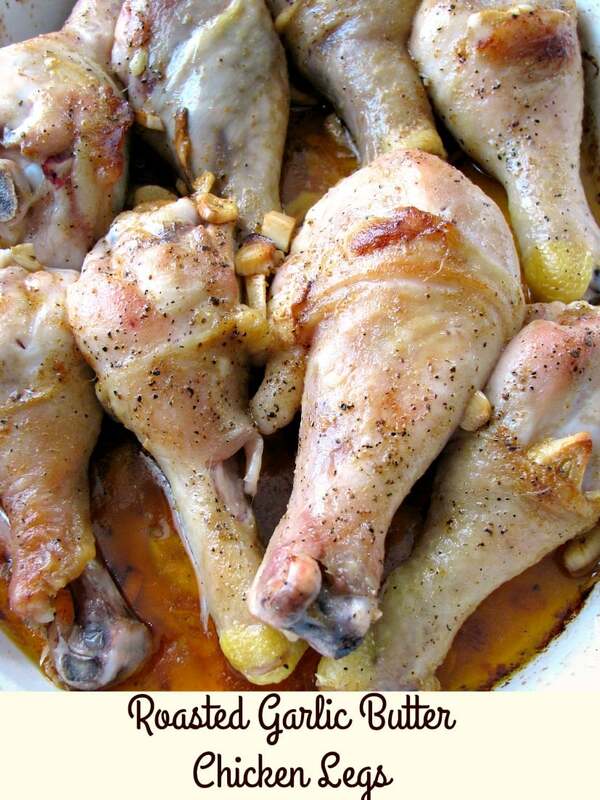 Place the chicken legs in a baking dish. Bake in the preheated oven for 45 minutes, basting after 20 minutes, then once or twice again, until the chicken reaches at least 165 degrees and the skin is golden. Serve with the garlic butter sauce.